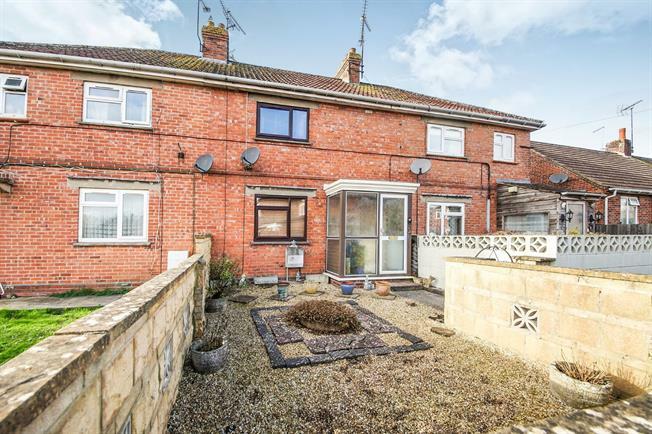 2 Bedroom Terraced House For Sale in Wincanton for Asking Price £156,950. A fantastic opportunity to purchase this two bedroom terraced house situated within the desirable town of Wincanton. The property benefits from flexible accommodation comprising: Kitchen/Diner, Living room, two Bedrooms and a Bathroom on both floors. There is also a brilliantly sized, sunny aspect rear garden, which must be viewed to be appreciated. The property would likely suit a first time buyer, investor or young family. Early viewing is highly recommended. With door to downstairs bathroom and rear garden respectively. With panelled bath and electric shower over, white ceramic pedestal wash hand basin and low level WC. Large storage cupboard with associated shelving and obscured double glazed window to rear. With loft hatch access and doors to both bedrooms and bathroom respectively. With double glazed window to front and large built in wardrobe with sliding doors. With double glazed window to rear. With walk in shower, pedestal wash hand basin, and low level WC. Large airing cupboard housing water tank and associated shelving. Double glazed window to rear. A walled front garden laid with chippings. Potential to create off road parking space. A particularly noteworthy, brilliantly sized rear garden. Bordered with sections of chippings and various plants and small hedges. The garden offers large open spaces, and a seating area perfect for Al fresco dining.